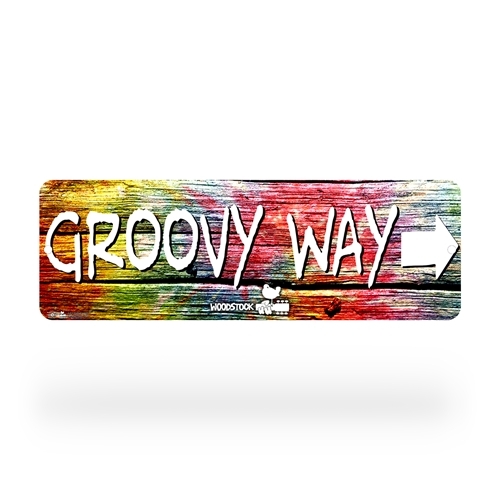 The psychedelic official Woodstock "Groovy Way" Street Sign is now available through Bluescentric. 1969's Woodstock Music and Art Fair brought hundreds of thousands to Bethel, NY, where festival 'streets' like Groovy Way and High way guided loving concert-goers to different areas of the sprawling Yasgur Farm where Woodstock was held. The groovy design features a tie-dye wood background, the words "Groovy Way" and Woodstock with the Bird & Guitar". Now bring a street from Woodstock to your music room, studio, home office, listening room or garage. The Woodstock sign is full-color on .026 aluminum, and measures 18 inches by 6 inches (147 x 153 mm), with 3/4 inch rounded corners and two 1-3/8" drill holes for hanging. Works for indoor or outdoor, and will last years. For maximum life, try to keep away from continuous, direct sunlight.